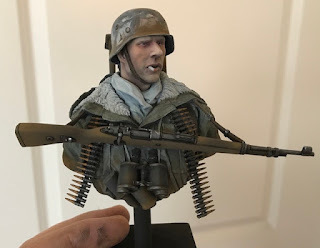 This is guy completes the German MG34 team that I purchased last year. 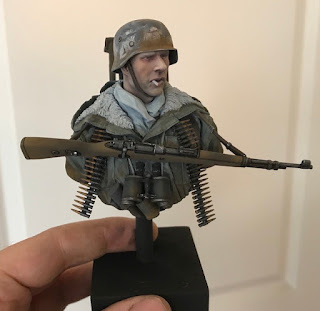 I tried some new techniques on this guy, like using oils for the coat and face. I'm not sure I like the effect, but at least it is complete. He looks very lifelike - just like he stepped out of an episode of Band of Brothers. I don't think I'd be brave enough to use oils on a human figure, but if you don't take risks, you don't learn. 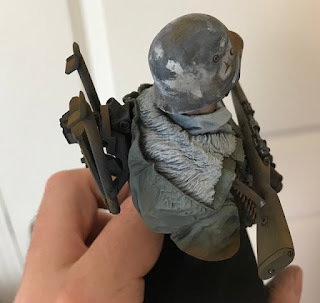 The surprising part was that the oils looked smooth initially but dried a little splotchy. I had to use thinner after the fact to even them out. Yep - that's one heck of a job. I appreciate the comments guys. I guess I'll take him to the show, flaws in all.